With the rush of every-day life it can be difficult to think of new recipes, and although the internet can be very helpful, I find sometimes it prevents me from being truly creative with my own cooking. I love the practicality of being able to be creative on the spot with what ever ingredients are available in the refrigerator and on the shelf. Lately, I haven’t had as much time or opportunities for creativity as I’m cooking for myself only most of the time, as one meal will last me days and days. Today, however, I had the chance to try something new, and it was delicious and fun as well! To make the carrots, preheat the oven to 400F. Slice the carrots and place in a bowl with all the seasoning and the oil. Toss until evenly covered and then lay out on a baking sheet lined with parchment paper in a single layer, with no carrots touching (it’s the key to perfect roasted veggies!). Bake for 20-25 minutes, until golden-brown. Serve with hummus if you like! To make the hummus, soak the chickpeas or use canned, and roast the garlic. Then combine chickpeas, garlic, water and tahini in a food processor and process for 2-3 minutes until smooth. Then add remaining ingredients, and process for another 1-2 minutes. Place in serving bowl. 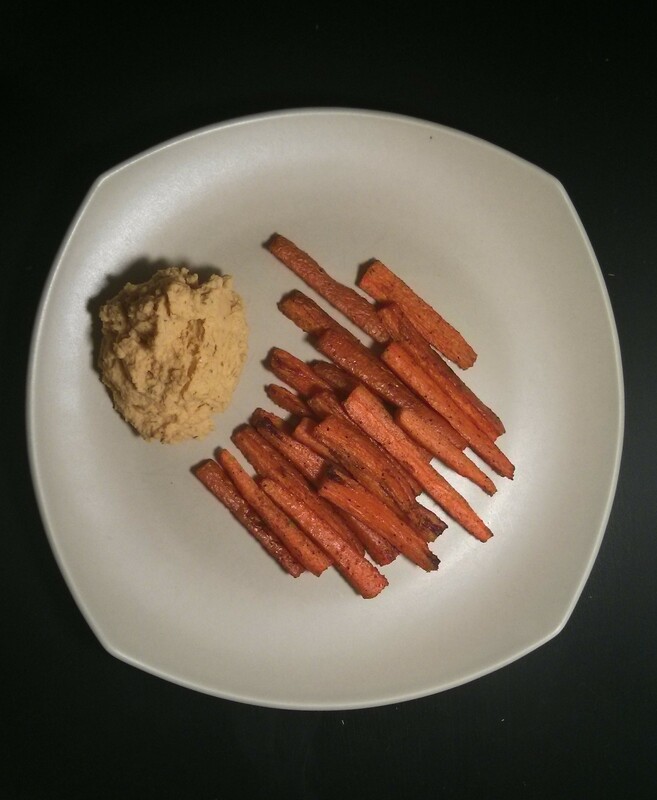 I envision the carrots and hummus would be great as a finger food for a dinner party: just have tooth picks on hand and enjoy! 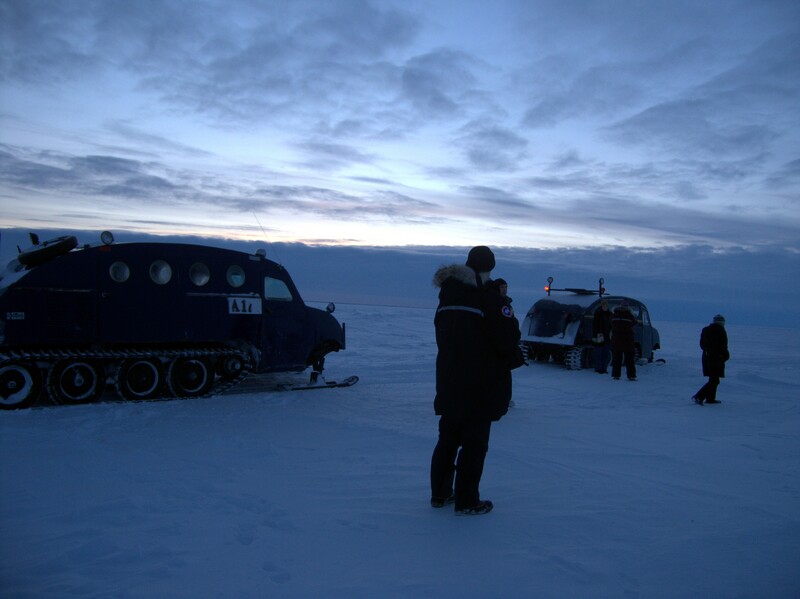 A few weeks ago I had the opportunity to go ice fishing with a local fisherman who showed us how to set nets under 4.5 feet of ice, which blew my mind. After we brought the nets in, I watched him fillet at least two dozen large fish, of four or five varieties. I’m looking forward to fishing myself, and attempting to fillet the fish after what I learned – I assume it will be a lot sloppier and slower, but I’m ready for the challenge! After we fished we ate an absolutely delicious meal of sashimi, pan-fried fish with dill, and bannock in one of his cabins out on the lake. I have never had such fresh sashimi! We ate so much fish, and yet there were many left-overs. We brought many different types home, including the left-over sashimi fillets which we turned into this delicious stir-fry for lunch the following day. This stir-fry is amazing not only because it’s delicious but because it is also incredibly fast and simple! Slice, dice, and prepare all stir-fry ingredients. Heat oil in pan over medium-high heat, then add garlic. Stir, then add the fish. Saute on medium for a few minutes, then add the remaining veggies. Continue to stir often, and cook for about 6 minutes until the fish is cooked and the veggies are still crunchy but hot. Season with salt and pepper and soy sauce. 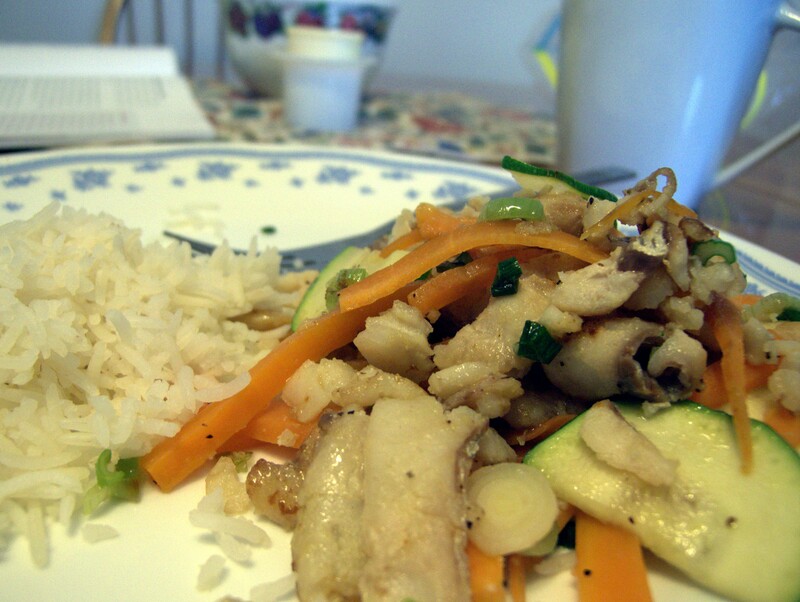 Serve the fish stir-fry over rice with soy sauce. Last Saturday I took advantage of passing through Kensington Market in Toronto and picked up some fresh whole jackfish. “Do you want me to clean those fish?” the fishmonger asked me. Stunned, I took a second to reply. “Why, of course, that would be really nice” I ended up saying, while I smiled inwardly realizing how I have no problem doing so myself, but enjoyed having someone offer to help. I had sent scales flying on more than one occasion in Gambia, and I’m not squeamish. I’m not going to turn down the help though! It’s kind of funny and ironic: some of my most common culture-shock has surrounded food (perhaps I should call it food-shock). 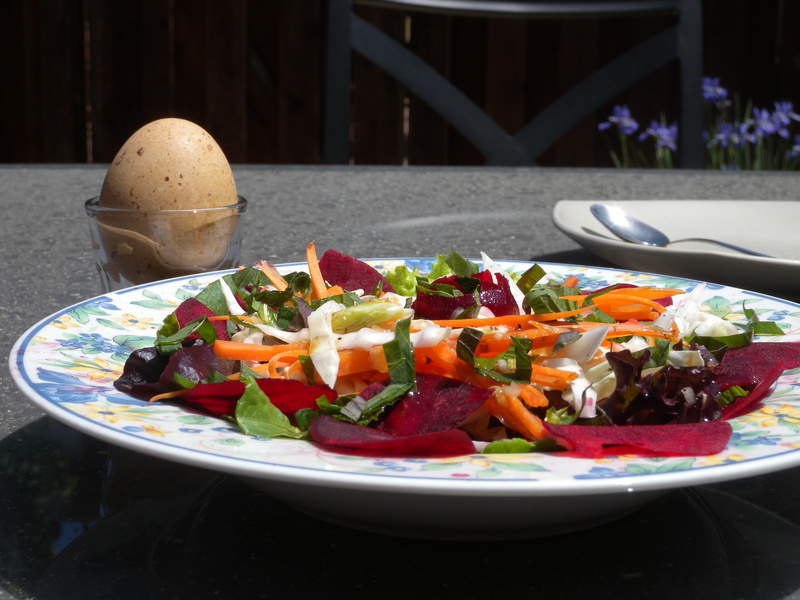 Although I definitely felt it when I arrived in Gambia (I would have given almost anything for vegetables, fruit and sweets at first, and then it was low-oil cooking, and finally it became meat and dairy), the real surprise has been feeling reverse food-shock as I readjust to Canadian life. I wake up craving fish, I don’t feel full unless I eat rice, and I eat as if 10 people were competing with me for my food at each meal- meaning I eat a mile a minute. Mind you I am definitely enjoying my veggies again. This recipe is one I was delighted to discover: its spiciness I couldn’t resist on a hot, hot day, and I was forever grateful for its lack of oil. For me on a hot steamy day there’s nothing better than a spicy but light at the same time meal. Clean and wash the fish. Slice the onions. Place water in a pan, add the onions, and increase heat to medium-high until it boils. Meanwhile, clean the garlic, and pound the garlic, peppercorns, hot pepper, and bouillon until they are a smooth paste. When the water boils, dissolve the seasoning mixture into the water, and add salt to taste. Add the red pepper and tomato and stir, letting the mixture simmer, for 2-3 minutes. Add the fish and lemon juice and poach the fish in the soup, for approximately 4-5 minutes per side. Serve with fresh baguette in a deep plate. You can sprinkle finely chopped parsley on it if you’re feeling creative! Having another home in West Africa means I have added a whole new repertoire of recipes, West-African style, to my cooking – and I’m really excited to share them on gourm(eh). Cooking in Gambia is a totally different story than here. Imagine cooking mostly one-pot meals over an open fire, or if you are fortunate enough, an improved cookstove. It a communal experience, and the saying ‘many hands make for lighter work’ is fitting as the work is hard, and most often done in groups. I found it interesting that my taste buds actually adjusted while living there: a dish I did not like at first became one of my favourites by the end – and this was actually the case with a number of dishes. Domoda, however, was always at the top of my list from the beginning! 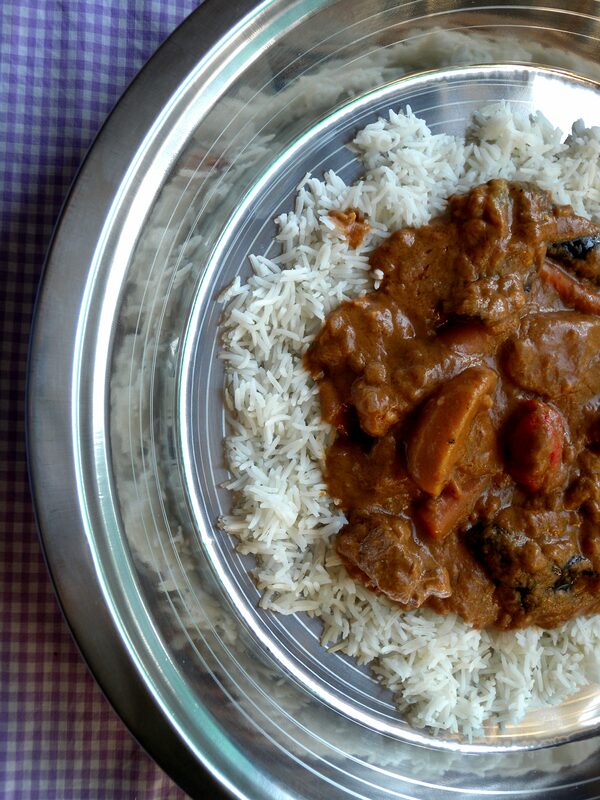 Domoda is a rich groundnut (peanut)-based stew, a favourite of mine from Gambia and Senegal. In a heavy-bottomed pan with a lid, heat oil over medium-medium high heat. Brown the beef, reduce the heat, and add the onions until they are translucent. Then add the tomato paste and stir. Cook for another 3 minutes stirring occasionally. If you have a mortar and pestle, pound the peppercorns and then add the garlic and the bouillon cubes until you get a smooth paste. If you don have a mortar and pestle, just chop everything finely and mix by hand. Add the seasoning mix to the meat, stir, and then add the vegetables and the whole (washed) hot pepper. Cover with water, stirring well to incorporate all the tomato onion mixture. Increase the heat and bring to a simmer. Once it simmers reduce heat to medium low and let simmer for 30-40 minutes. Meanwhile, remove a cup of hot liquid and pour into a large bowl with the peanutbutter. Stir well with a fork until the peanutbutter is all incorporated. Stir this into the pan with everything else, and stir well so everything is evenly mixed. Add the lemon juice. Let the mixture simmer uncovered until you have a stew-like consistency. If you find the vegetables still need more time but there is little sauce left, just cover the pot. When it is almost ready, cook rice according to package instructions. To serve, ladle stew over rice. You can squeeze the hot pepper on your spoon a tiny bit to get spicy juices out thereby tailoring how spicy your own plate is – and then share the hot pepper with the others. Just remember scotch bonnets are VERY spicy! As this post suggests, I am back! I must admit the fast pace of life throws me off a but here, as do all the choices availe in the super-market, and the orderly queues. Oh yeah, and Toronto feels so cold… apparently it is possible to acclimatize to new environments quite easily. First of all I want to thank Catherine for all her wonderful contributions to Gourm(eh) while I was out of regular internet range. Catherine is alive and well in Kenya now (we traded continents, and spoke today! ), and I am back in Canada. Now, it is my turn to share my west African adventures with you. 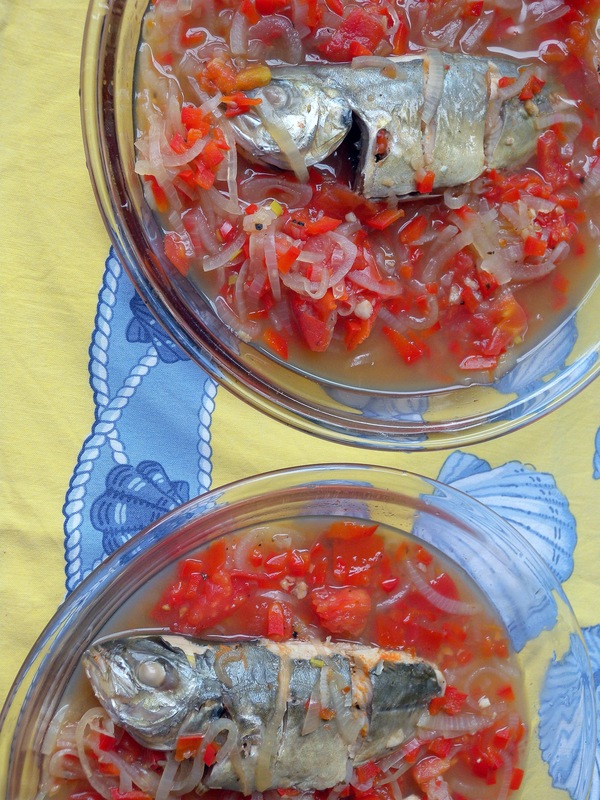 Actually, for the next little while I have many, many recipes I want to share: both Central America-inspired and Senegambia-inspired, and I hope you will enjoy them as much as I do. I find it exciting to try new styles of cooking, and each of these recipes has so many stories and memories attached I cannot help but be excited to post them! Akara, or bean fritters, are very common throughout West Africa. I typically purchased them from women frying them on charcoal stoves along the streets who packaged them up in ripped brown paper from flour bags and doused them in spicy sauce. Resisting the urge to eat them right away, I would carry them home and eat them from the comfort of my mat while sharing them with my friends. Soak beans overnight in plenty of water. The following day, squeeze or rub the skins off the beans (if a few remain, don’t worry), remove them by dumping the water out of the beans. Keep the beans in a large bowl and pass the water through a strainer to catch the skins. Add more water and continue to remove the skins and wash the beans. Clean the onions and half the hot peppers in a food processor or blender with the beans and pulse. Pound the pepper corns and add to the mixture, and add the parsley if you want to add a bit of a unique taste. Pulse well, until a you have a thick bean paste. Add salt to taste and the remaining hot pepper if you want the fritters to be spicy (warning: scotch bonnet peppers are very, very spicy). Heat up about a centimeter of oil in a pan with a lid over high heat. Once heat-waves show up on the oil reduce heat to medium high. Carefully add spoonfulls of the bean mixture into the hot oil. Test it with one first, and make sure to add more only when the oil is bubbling around the bean paste. Cook for a couple minutes on each side, then remove from the hot oil with a slotted spoon and drain on paper towels. Dice the onions and garlic. Heat up the oil in a frying pan and add the onions and pounded black pepper. When the onions begin to become transparent, add the garlic and cook for another minute. Then stir in the tomato paste and cook for a couple more minutes before adding the chopped hot peppers and 1 cup water. Increase heat to medium-high until mixture boils, after which reduce the heat and simmer until at least half of the water has evaporated, and the sauce thickens. Add lemon juice and season with salt. 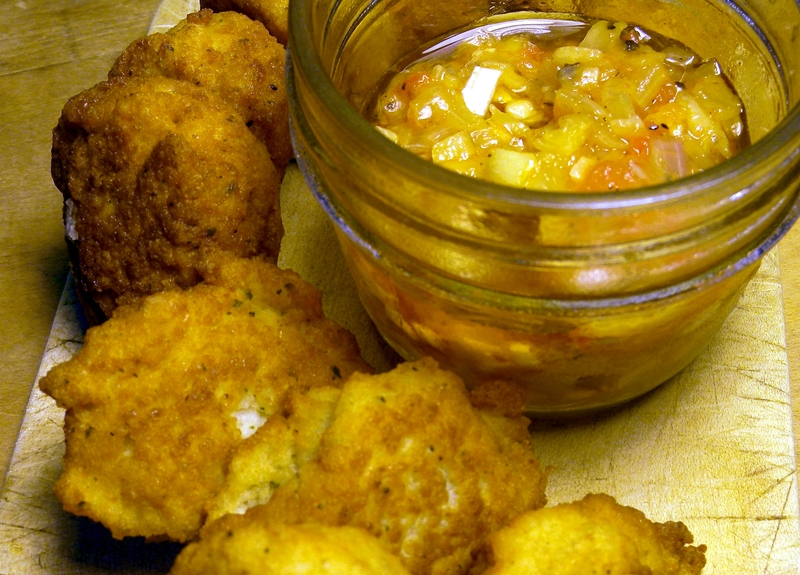 Pour sauce over fritters, and serve as an appetiser or main course with a salad. A few weeks ago, I had an excuse to bake a celebratory cake. While searching for a suitable recipe, a small side note from the “About Angel Food Cakes” section in Joy of Cooking caught my eye: it suggested that to jazz up an angel food cake, to stuff it with lemon curd. The complementary flavours of tangy lemon layered inside a light angel food cake captivated my imagination (not to mention my tastebuds). I decided to finish the cake with a whipped cream frosting stabilized by rich mascarpone cheese. Mascarpone is a rich, spreadable, Italian cheese, almost custard-like in flavour. It helps thicken the frosting, while retaining the lightness of the whipping cream. The cake was suberb – with the flavours melding perfectly. For my parent’s wedding anniversary this weekend, I tried it out on my mother (who is a self-declared dessert connoisseur), and she too declared it an absolute success. While slightly fiddly to assemble, it is certainly worth every second of effort! Coincidently, a few weeks after my initial test run, Canadian Living came out with a similar recipe for mother’s day. I suspect most mothers would love this special dessert next Sunday! Note: The egg whites should be at room temperature. Preheat the oven to 350. Have ready an ungreased 10-inch tube pan (preferably with removable sides). Sift together three times the flour, 3/4 cup sugar and salt. In a separate large bowl, combine the egg whites, water, lemon juice, cream of tartar, and vanilla. Beat on low speed for 1 minute. Increase the speed to medium-high and beat until the mixture increases to 5 times in volume and resembles a soft foam, about 3-5 minutes. On medium-high speed, beat in 1 tablespoon at a time, taking 2 to 3 minutes 3/4 cup sugar. When all the sugar has been added, teh foam will be creamy white and hold soft, moist, glossy peaks that bend over at the points: do not beat until stiff. Sift a fine layer of the flour mixture (about 1/4 cup) evenly over the batter and fold gently with a rubber spatula only until the flour is almost incorporated; do not stir or mix. Repeat 7 more times, folding in the last addition until no traces of flour are visible. Pour the batter into the pan and spread gently to level the top. Bake until a cake tester inserted in the center comes out clean, 35 to 40 minutes. When the cake is done, invert immediately and cool upside down in the pan, to prevent it from sinking. Use the feet of the pan to hold it above the surface of the table or prop it higher by resting the tube on a bottle or inverted funnel. Let the cake cool for at least 1 1/2 hours, until it is thoroughly set. To remove the cake from the pan, slide a thin knive around the cake to detach it from the pan and the tube. If you have removable sides, slide the knife under the cake to detach it from the bottom. Let the cake cool completely before frosting. Whisk together in a saucepan until light in colour the eggs, sugar, and lemon zest. Add the fresh lemon juice and butter. Cook, whisking constantly, over medium heat until the butter is melted, the mixture is thickened and simmers gently for a few seconds. Using a spatula, scrape the filling through a medium-mesh sieve into a bowl. Stir in the vanilla. Let cool, cover, and refrigerate to thicken. With an electric mixer on medium speed, whisk whipping ceam until stiff peaks form (be careful not to overbeat, or cream will be grainy). In another bowl, whisk together mascarpone and confectioners’ sugar until smooth. Gently fold whipped cream into mascarpone mixture until completely incorporated. Using a very sharp serrated knife and a gentle sawing motion, carefully cut the cake horizontally in thirds. Lay the bottom layer on a serving platter. Gently spread half of the lemon curd over the cake. Place the middle layer over the curd. Gently spread with the remaining lemon curd. Cover with the final third. Using a frosting spatula (or a butter knife), frost the entire cake including tops and sides. 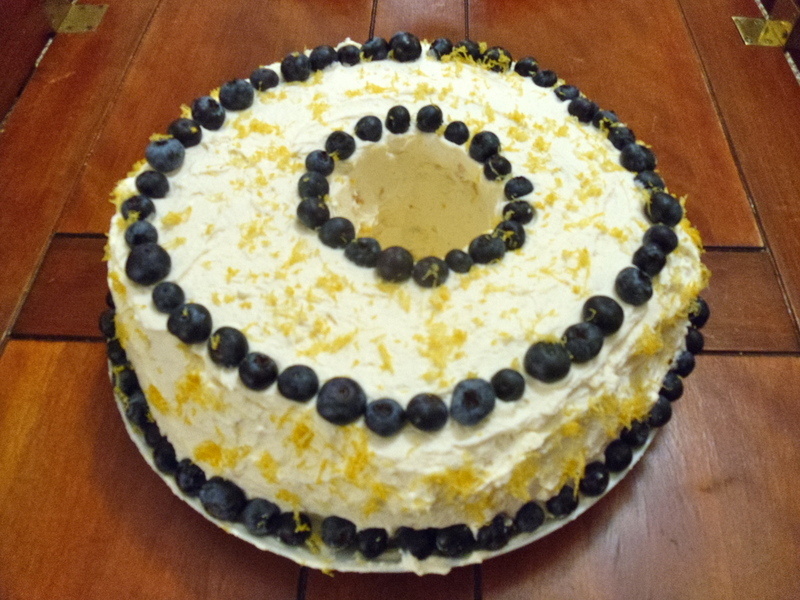 Decorate with blueberries and lemon zest. Bon appetit!